Winslow Homer (1836-1910) was born in Boston and grew up in a part of Cambridge that later become Belmont. He inherited his mother’s artistic skill and taught himself to draw and paint. As a young man he apprenticed as a lithographer in Boston (which seems to have been a rather dismal experience for him), then set off to New York in 1859 at age 23 to establish his own studio. By 1861, he was working as an artist for Harpers Weekly. With the Civil War looming, Harpers sent him to Washington City in March 1861 where Homer rendered depictions of Lincoln’s inauguration. On October 15, 1861, Homer was issued a pass as an “artist-correspondent” and was able to come and go from Union camps in the vicinity of Washington as he pleased. Later, in 1862, he went with the Army of the Potomac for much of the Peninsular Campaign and was virtually on the front lines during the Siege of Yorktown and the Battle of Seven Pines. It is significant that Homer chose not to draw scenes of glorified charges as most of his contemporaries did, nor did he depict the high ranking heroes (with one exception…he did publish a drawing of McClellan). Rather, Homer was most captivated by scenes of camp life. His works bore such titles as, “Bivouac Fire on the Potomac,” “Thanksgiving in Camp,” “Sharpshooter on Picket Duty,” “Pay Day in the Army of the Potomac,” and “Home Sweet Home”…the latter being developed into a famous and poignant painting of soldiers in a humble camp listening with somber demeanor to the song being played. The scenes he chose were candid, real, and earnest. They are generally passive, not action scenes by any means, yet the sense of emotion and atmosphere in his works are nonetheless palpable. His art provides a wonderful, valuable source on the Civil War soldier as he truly was. Just a few months after the end of the war, in the summer of 1865, Homer painted “Veteran in a New Field.” It depicts a Union soldier just home from the Civil War. He has dropped his uniform coat, haversack, and canteen (which bears the badge of the First Division, II Corps…in which Homer was “embedded” for a time). It would seem as though the veteran has immediately picked up a scythe and set to mowing. You like to think he took a moment to say hello to the family, but I don’t really get that impression. He’s got work to do. Look up this painting in any art book and I almost guarantee you will read the same refrain. 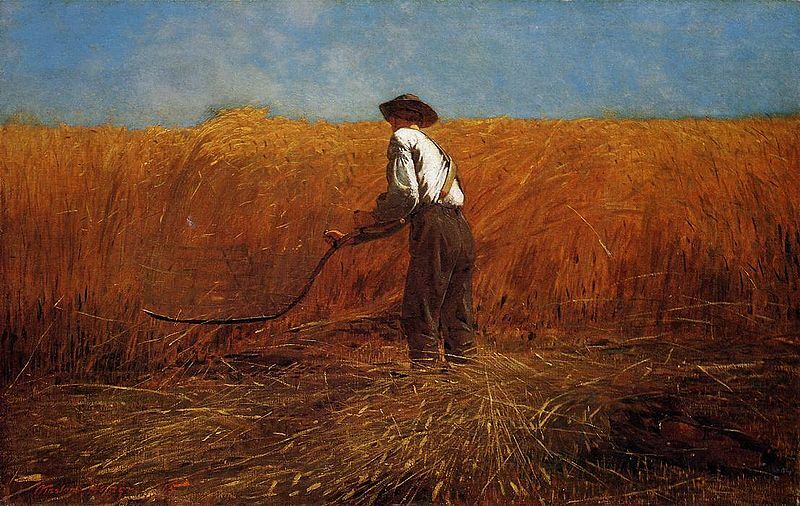 The main theme of the painting, most argue, is that Homer is comparing the soldier to a harvester of men. The fallen grain comparable to the rows of dead you see in Matthew Brady’s photographs. The scythe, naturally, is the weapon of the grim reaper and this is what the soldier has become. I appreciate the fact that art can hold many different meanings to different people. And I don’t deny that the symbolism of the scythe is powerful and probably intentional on Homer’s part. But it is a symbol of the soldier’s past, utterly over-ridden by positive imagery. I see nothing but optimism in this painting. Always have. There is a golden field, stretching as far as the eye can see. His head is surrounded by a cloudless blue sky. A New Field lies before him. It may be the same one he worked before the war. But it is different now. And he is different. Despite what he’s gone through, despite the fact that a new, endless field of grain may be daunting, he drops his uniform, picks up the scythe and carries on. For Homer, I imagine this was primarily an expression of the bright future that awaited our reunited country and the promise of renewal that awaited our veterans. For me, its a reminder to keep mowing, particularly when presented with a New Field.